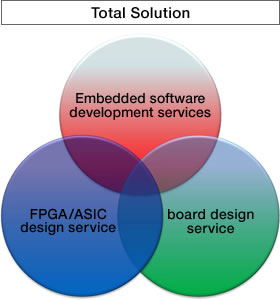 The strength of Mpression design services lies in our development services integrating hardware with software, including everything from FPGA design, to board-level design and development, and embedded software development. We offer the optimum support in line with our customers' development needs, from individual stand-alone services to integrated services. We provide custom design and development services from the FPGA to the board level, starting with drafting of specifications. We boast a proven record leveraging the skills cultivated through ASIC design, and designing for high-speed transmission at the board level. We offer a broad array of development services, from development of device drivers, to porting of various middleware, and development of embedded Linux-based system-level software. Our development services are for both hardware and software, from the stage of considering specifications and methodologies.